This multi-level raised bed features soft curves that add a refined organic feeling to your garden. Stunning as a flower garden focal point. Incredibly functional as a veggie garden. Plenty of depth to plant potatoes or other root vegetables in the deep 22 in. Level, then cascade down from luscious tomatoes to fragrant herbs in the shallower levels. Tuck neatly into a corner or use two kits to create a grand entrance or to outline a patio area. Your kit comes with everything you need except the soil and plants. Each modular kit includes twenty of our 1 in. Classic Sienna straight composite boards, eight curved composite boards and twenty-eight of our 1 in. The insulating open-channel boards trap air, providing insulation to your soil. Keeps soil warmer in the Spring and Fall and cooler in the Summer, so you can grow for an extended period. 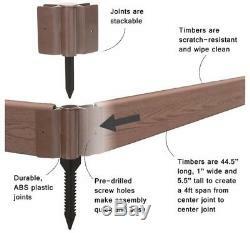 Stacking brackets allow you to install the additional layers of your garden just by inserting the stakes into the brackets below. Our Raised Garden Bed Brackets pivot 270 allowing endless design options. As your garden needs and expertise grow you can add on to your modular raised bed any time by purchasing additional 1 in. 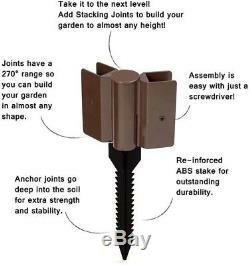 Kits, boards and anchor or stacking brackets to stack or extend your garden. Boards are also available to incorporate into your design. Classic sienna composite boards feature textured wood-grain finish that blends into any environment. 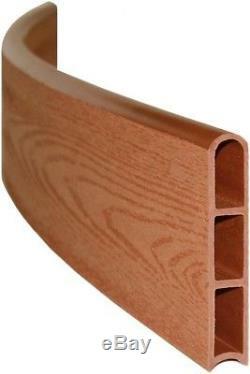 Eco-friendly composite boards are made from 38% post-consumer recycled plastic and 62% sustainable hardwood fibers. Minimal tools required a hand or power screwdriver and a mallet or hammer is all you need. Boards can be cut with a hand or power saw to create different designs or fit particular dimensions. Unlike cedar, wont rot, warp or fade. Create your own unique design with 270 pivoting brackets. 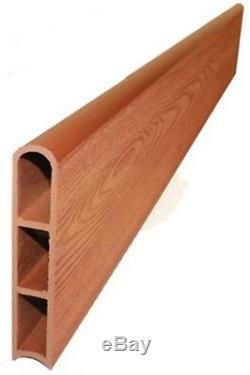 : 144 Color Family: Wood Color/Finish: brown Material: Composite Product Weight lb. 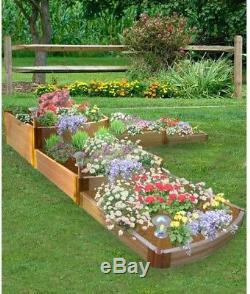 : 120lb Raised Bed Features: Expandable, Multiple Tiers Returnable: 30-Day Shape: Square. Your feedback is very important to us. All merchandise ships from our U. Based warehouses for free within the United States. AK, GU, HI, PR, VI. There they process and forward your item to the address you provided. When returning an item, it must be in all of the original packaging and include all of the original accessories or items that came with it. We do our best to process as quickly as possible. For Electrical Items: These products are manufactured according to the specifications of the US Electrical Standards and codes. We assume no responsibility if the item malfunctions or causes an accident because you tried to use the product with foreign electrical standards. The use with a converter or other voltage transforming device is at your own Risk. Please Note: Products are designed and rated for use in the US using 120 volt current. With or without a transformer, this product is not recommended for use outside the US. We know how important it is for you to get what you ordered and get it fast. Our products are a 100% authentic and brand new. We guarantee you only the best experience when shopping with us! 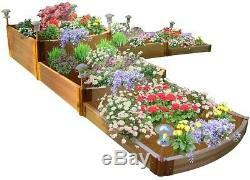 The item "Raised Garden Bed Kit Growing 80 sq. Expandable Multiple Tiers Composite" is in sale since Monday, April 9, 2018. This item is in the category "Home & Garden\Yard, Garden & Outdoor Living\Gardening Supplies\Plant Care, Soil & Accessories\Baskets, Pots & Window Boxes". The seller is "bargainhunter108" and is located in Irvine, California. This item can be shipped to United States, Canada, United Kingdom, Denmark, Romania, Slovakia, Bulgaria, Czech republic, Finland, Hungary, Latvia, Lithuania, Malta, Estonia, Australia, Greece, Portugal, Cyprus, Slovenia, Japan, China, Sweden, South Korea, Indonesia, Taiwan, South africa, Thailand, Belgium, France, Hong Kong, Ireland, Netherlands, Poland, Spain, Italy, Germany, Austria, Israel, Mexico, New Zealand, Philippines, Singapore, Switzerland, Norway, Saudi arabia, Ukraine, United arab emirates, Qatar, Kuwait, Bahrain, Croatia, Malaysia, Brazil, Chile, Colombia, Costa rica, Panama, Trinidad and tobago, Guatemala, Honduras, Jamaica.